If you missed Bryan Stevenson’s visit to NIU on Oct. 24, it’s not too late to find out what he had to say and continue the conversation around injustice, humanity and mercy. As an NIU faculty, staff or student, you have exclusive access to Bryan Stevenson’s remarks during his NIU visit using your NIU username and password. Stevenson, author of this year’s common reader, Just Mercy: A Story of Justice and Redemption, and the founder and executive director of the Equal Justice Initiative, works to fight against poverty and racial discrimination in the criminal justice system. Over 60 percent of NIU’s freshmen class participated in the Common Reading Experience (CRE) this year by using the book in their UNIV 101 and/or English 103 classrooms; many of these students also attended at least one CRE event this fall semester. 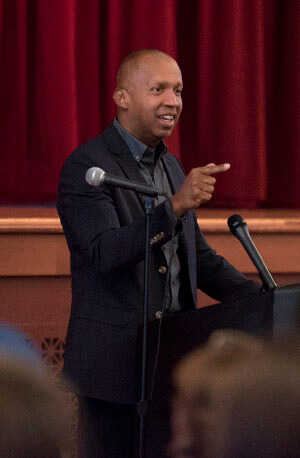 Consider viewing (and/or sharing with others in the NIU community) all or parts of Bryan Stevenson’s 4:00 p.m. and/or 6:30 p.m. presentation to continue these important discussions inside or outside of the classroom. Using NIU employee or student IDs and passwords, the 4:00 p.m. presentation to UNIV 101/201 students can be accessed at https://hml.niu.edu/Play/4872. The 6:30 p.m. presentation to NIU faculty, staff, students and the greater community can be accessed at https://hml.niu.edu/Play/4824. Stevenson’s visit was sponsored by the Provost’s Office, the College of Law and First- and Second-Year Experience, and is one of two other Diversity Dialogue events this fall. For more information about this and other CRE events, please visit go.niu.edu/CRE or contact First- and Second-Year Experience at fsye@niu.edu or 815-753-0028.